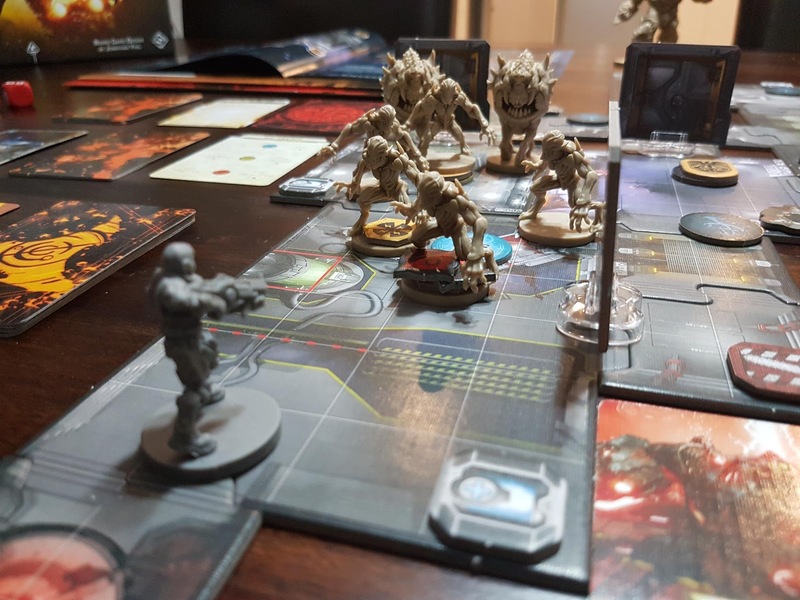 A few months ago I reviewed Doom: The Board Game, a one vs many shoot-em-up style tactical-minis game, created by Fantasy Flight and in a similar style to Descent and Imperial Assault (sans campaign mode). 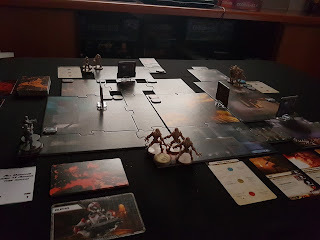 For the most part, it was a fun game with great components and had that essential first person 'video game' type feel to it. Gone were long-winded and drawn out campaigns, overly complex rules and endless references. Doom was quick, dirty and a blast to play (pun intended) and I absolutely loved the whole glory-kill mechanic and the weapon load-outs on the marines as well as the spawning nature of the demon hordes. Imp VS Marine dance off! So, why then has it not really seen much game-time with my avid gaming groups? 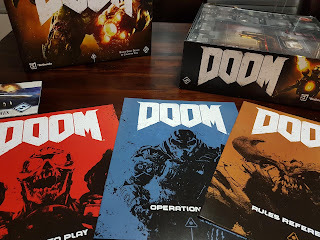 Since purchasing the game in early October last year, it's only hit the table about 4 times and, despite being a hit from the first play, it has sadly fallen by the wayside and laid on my shelf, the Cyberdemon box art grinning manically at me with almost mocking apprehension. I suppose the primary reason for the lack of gameplay is that our current group have our hands full battling the demonic entities of Faerun, let alone Mars. Also,our recent slew of Dungeons and Dragons campaigns from Ravenloft to Ashardalon and Drizzt have all been co-operative board games. As a team we have delved into dungeons, cajoled through fiery caverns and perilous pits and battled monster after monster, for after foe. Our victories have been tumultuous, our defeats sombre and contemplative, but through it all, we have gone through the experience as a team. Which makes the idea of a 'One VS Many' style game seem both treacherous and blasphemous, considering all the bonds of fellowship we had forged over the months. First off, all you need to play the co-op variant is a copy of Doom and 12 mini cards you need to print out. These cards, along with a set of custom easy-to-follow rules, form the basis of the AI engine that drives the game. As expected, you and 3 other marines will square off against hordes of demons, powered by the game's AI Invader player. The objectives are fairly straightforward: kill or be fragged. And if the Invader manages to frag every marine, its game over. Four-person shoot-em-up. Who said it couldn't be done! Setup is more or less the same. You still construct a map with a few portal spawning points and it is recommended that you build your map in a circular layout so that demons don't 'bunch-up' at doors and narrow passages. I kinda like the whole bunched up demons concept though. It reminded me of those old retro classics where programming glitches would result in several henchmen stuck in a doorway, twitching in and out of sync with the game and all you needed was a grenade or rocket launcher. Stuck behind closed doors, these demons throw a party! However, the real core of the game comes from the event-deck (the 12 deck of cards you will need to print). These get drawn during the round status phase to determine which demon groups to spawn at which portal and also what abilities will augment the demon hordes for that round (for example - an extra red dice for when demons attack). The event cards get drawn again during the demon activation phase to randomly determine which demon groups activate that turn. Marine activation is as per normal and the marine action phase proceeds as per the standard rule book. There are a few bits and bobs to take note of though. Demons with overwatch (such as the Possessed Soldiers) will always use their overwatch ability. Demons with any argent power will always use it and demon movement is such that the demons will only move as close to the marine as it needs to be in order to attack (so for a demon with a range of 5, it would be 5 squares away and within line of site of the marine). Also, the entire demon invader deck is used for defence and whenever a marine would attack a demon, the top card of the invader deck is popped off as defence. 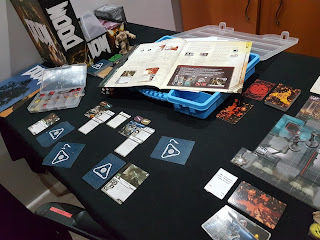 The initiative deck is as per normal but you need to keep track of the number of demon groups on the board. All in all, I found Horde Mode crazy fun to play with a few easily tweaked rules to make the co-op experience all the more entertaining. Some of my earlier gripes with Doom was that the game was frightfully unbalanced in favour of the UAC marine player(s) but with Horde Mode, it's an even and fair fight, leaning slightly more towards the Invader this time. 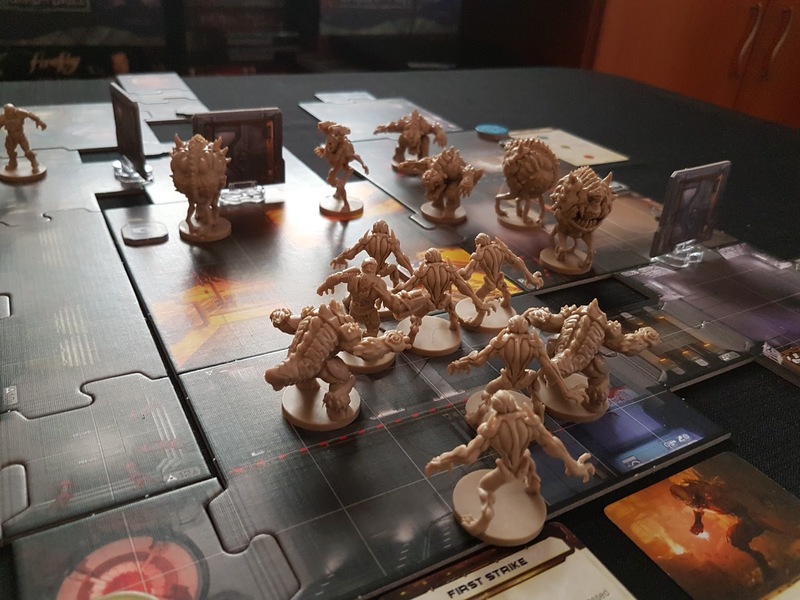 Demons can spawn quickly and each round phase flashes by until you find the board swarmed by demons with the marines having little to no chance of survival, given the single frag win condition. Use doors sparingly to prevent demons from spawning and being stuck in one location. 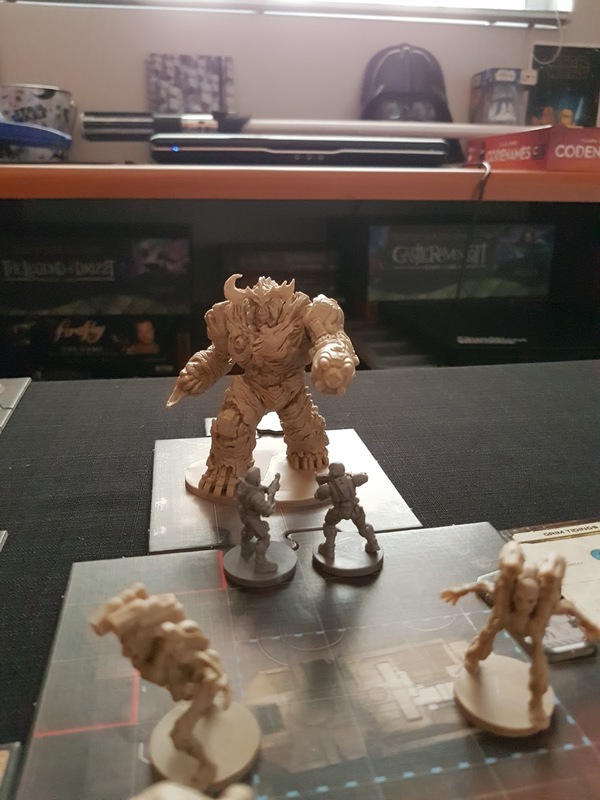 I built a map using all the tiles and had to adjust and re-start the game 5 rounds in when I realised that my demons were all concentrated in a single part of the map. Also, each time a demon attacked, I popped the top card off the invader deck to add extra bonuses to the attacking demon (Like I said, challenging). I also upped the special weapons to 4 (2 big guns and 2 explosives) for my 2-player marine hunting party. If you were using all 4 marines, I would up the special weapons to 8. I included 3 teleportation devices (2 including the starting device), scattered randomly across the map. I also included a very basic objective: Activate all teleport devices, kill all hostiles - just to add some extra flavor to the game. While I added a few custom tweaks to my liking, Horde Mode for Doom is a fun and lightweight co-op variant that is easy to play. 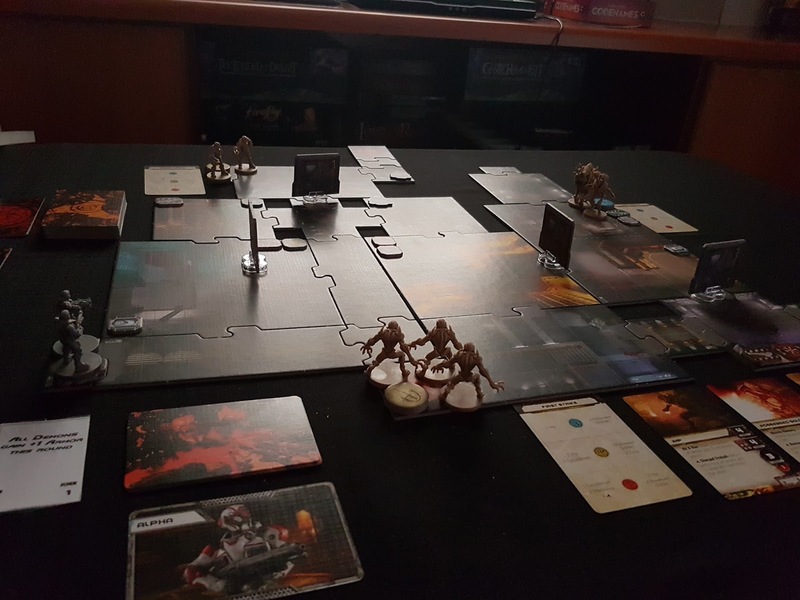 While it might lack the thrill of a human Invader player's unpredictability, it does allow for a fully immersible and easy to follow co-op gaming experience. My Rating on: Horde Mode for Doom - the board game: 8/10.